I decided to watch “The lost city of Z” shortly after seeing Triple Frontier, so I could bask some more in the glory of Charlie Hunnam. He is a gorgeous guy, but also a pretty decent actor, so I wanted to see “The Lost city of Z” because the story intrigued me and I also noticed Robert Pattinson and Tom Holland were in the cast list. I wanted to like this, but it was too slow-paced for me. It was so slow, that at one point I started thinking about how actors chose parts. Like, what makes them say yes, even if the script is boring or bad? Just for the money? Or is just that there were no other parts and this is what was offered to him? What made him choose this part? Hmm…maybe he did think it was a good script. Now, don’t get me wrong, the story is rather interesting and it sheds light into explorer missions in those times, and that alone is fascinating. For example, most academics didn’t think that primitives from Amazonia could be normal, or god forbid, have a long history behind them. But the pacing is way off, I think it could have definitely been made shorter. Some scenes steal (the piranha attack, meeting the new civilization, Percy’s interactions with his wife), but most are a bore. Acting wise, I can’t really fault them. 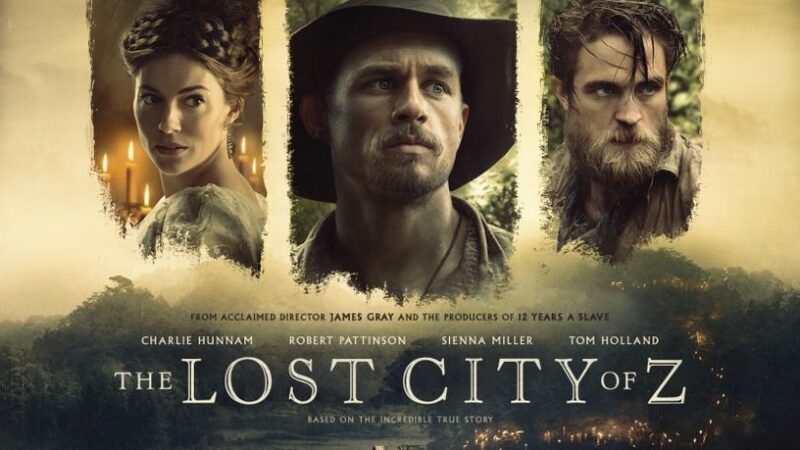 Sienna Miller and Robert Pattinson were surprisingly good, and Charlie Hunnam did a great job (I heard he went full method for this role, letting go of all technology and social media whilst he filmed). Tom Holland did his part, but I don’t understand the casting, because in what universe is Charlie Hunnam believable as a father to Tom Holland? In conclusion, “The lost city of Z” is an OK movie, but be warned that the slow pace will probably bore you. Still, if you want, watch it for the nice sets & costumes, the interesting story and for Charlie Hunnam. I love that this is where you looked to next after Triple Frontier! I’ve been tempted by The Lost City of Z for ages but even the bloggers who loved it said it felt long and I just can’t bring myself to see it! I’m not sure if you’ve seen it or not, but while King Arthur is not a great movie, it WAS entertaining, and there’s plenty of delicious Charlie Hunnam to appreciate! Oh, I have seen it, rest assured. He is delicious in that movie….and I actually enjoyed it, it wasn’t that bad! Thanks for dropping by! I read the book for this when I saw the previews and thought much the same thing about the book interesting but kind of dull. It is a great cast though! It is, Sienna Miller was also really good!